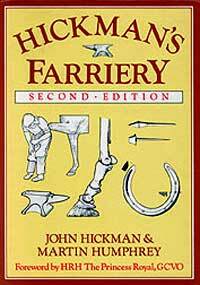 Hickman's Farriery was first published in 1977 and has since been completely revised and updated to bring it into line with the latest developments in this field. The new edition demonstrates how traditional skills can be combined with modern science to benefit the welfare, soundness and performance of the horse. The book begins with a short history of horseshoeing, tracing its origins to pre-Christian times. The authors then move on to explain the underlying structure of the horse's front and hind legs so that farriers can better understand the scientific principles of their craft. The tools used on the foot and at the anvil are described in detail, as are the various types of horseshoe that can be applied. The chapter on shoemaking includes numerous practical exercises, each one illustrated with specially taken step-by-step photographic principles of their craft. Further chapters examine the care of the feet in shod and unshod horses, including youngstock; methods of preventing slipping; and the use of pads. The final chapter looks at injuries caused by shoes and abnormalities of gait, the shoeing of defective feet and surgical shoes.